While the first floor of our house stays neutral the upstairs bedrooms is where I can have fun with color and that's just what I've done for Christmas. This is the first time adding a full size tree to this guest bedroom and I love it. 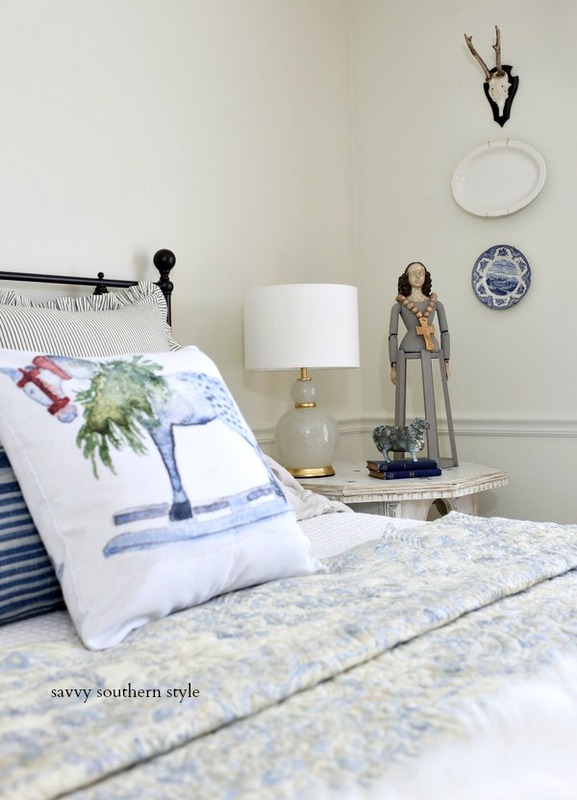 I kept with the colors that were already in the bedroom using the bed coverlet as my inspiration. 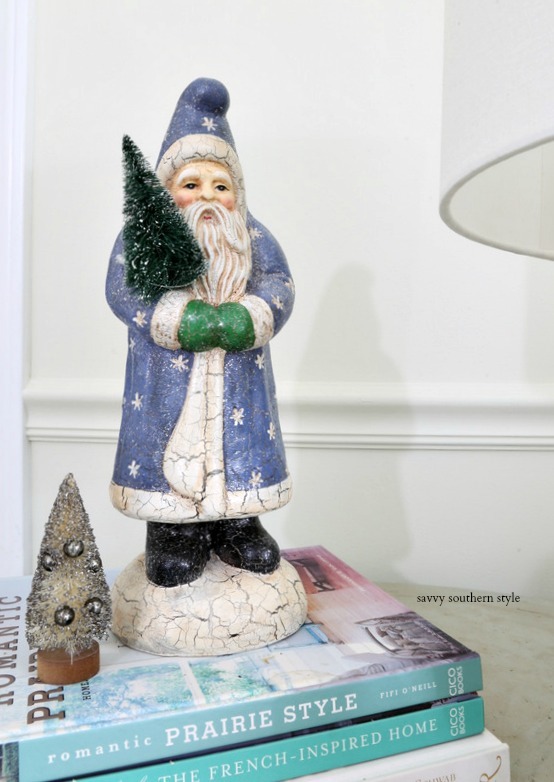 I'm also joining a fabulous group of bloggers for the Home For The Holidays Tour and you'll find all the links at the end of the post plus a giveaway! 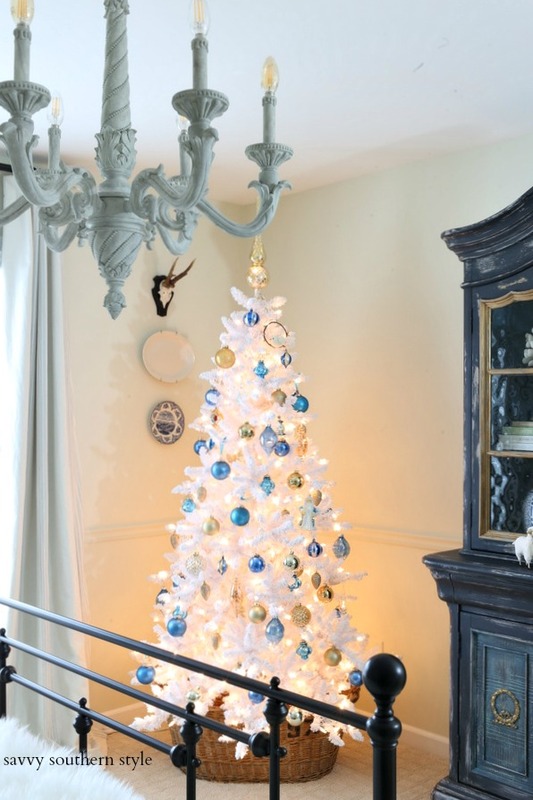 Come along as we tour a blue, white and gold Christmas bedroom. 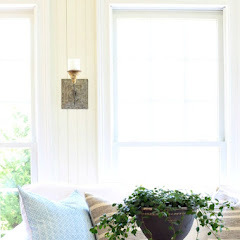 I used this tree in the dining room last year and you can see it here. 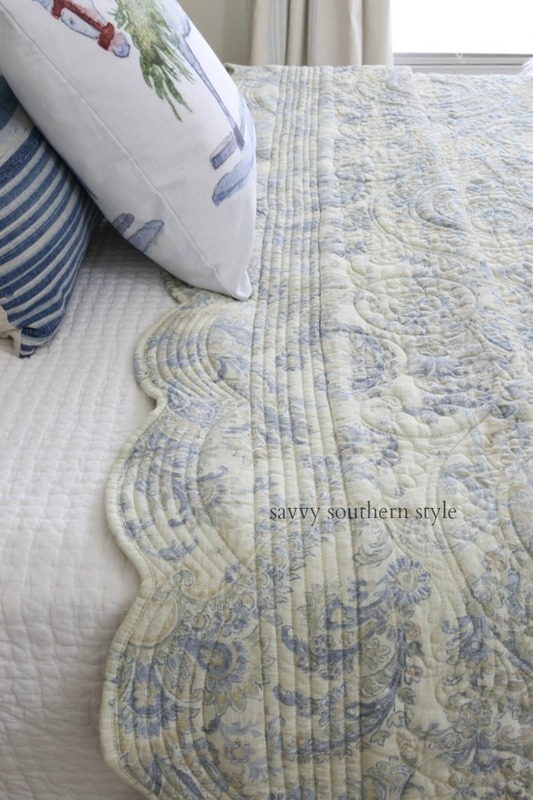 I purchased this coverlet last summer as the colors, pattern and scallops are perfect for this room. 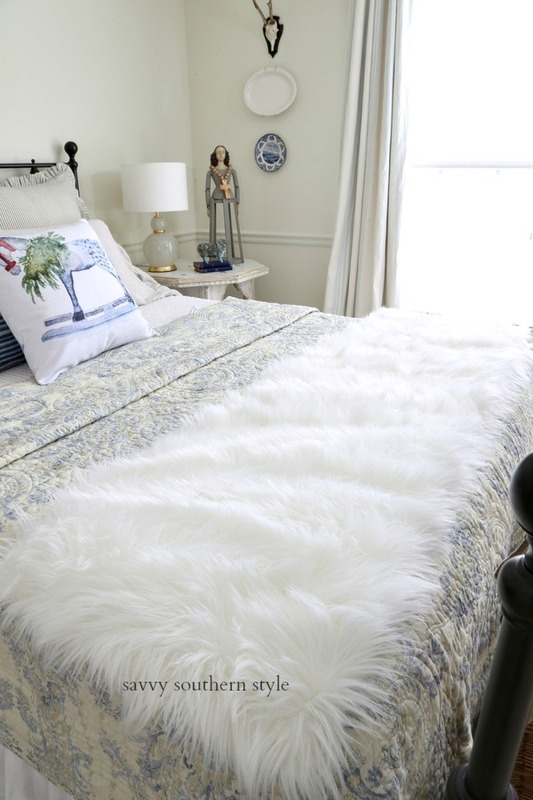 Just to add some fun I added this faux furry piece to the end of the bed. I ordered a new pillow to use on this bed this year, but it was mailed late. At least I can still use my favorite one. I ordered the handmade prayer beads from this Etsy Shop. 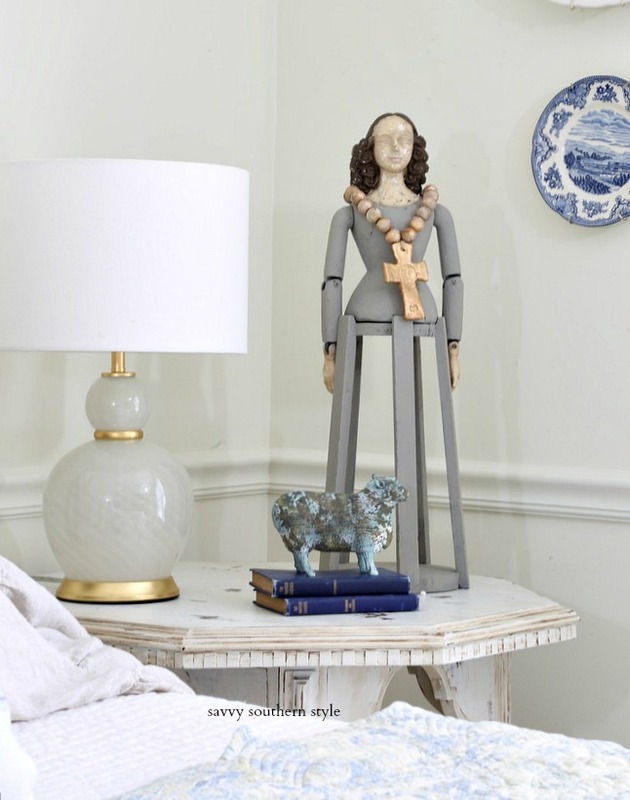 Vintage bottle brush trees and a vintage looking St. Nick sit pretty on this bedside table. This stocking also hung in the dining room last year. 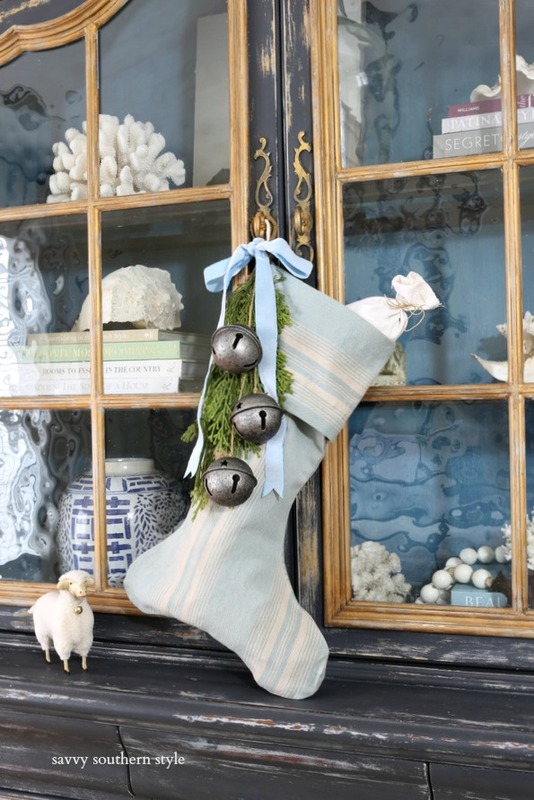 I purchased this grain sack stocking new this year and it may end up on the mantel. 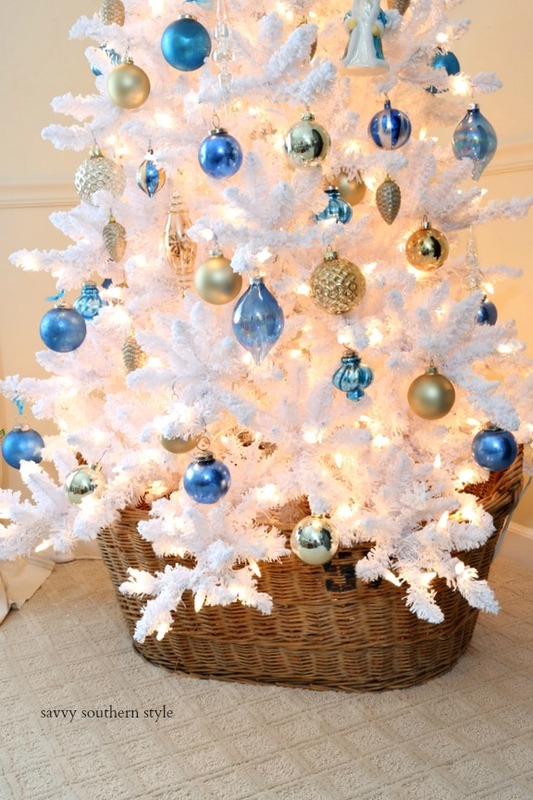 I decorated this tree first and tucked it in this vintage French market basket. Then the next two landed in baskets, too and Mr. Savvy said it's trees in baskets this year. Yep, it is. Here is the tree without the lights on. 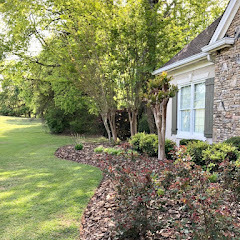 I hope you found some inspiration and you'll find much more in the links below. Entries for the Bespoke Decor give away must be in by December 1st. Our winner will be randomly selected and notified by email. Hi Diana....just here to say Merry Christmas and I can relate to your "rental situation" hopefully by next Christmas we will both be decorating our new homes!!! 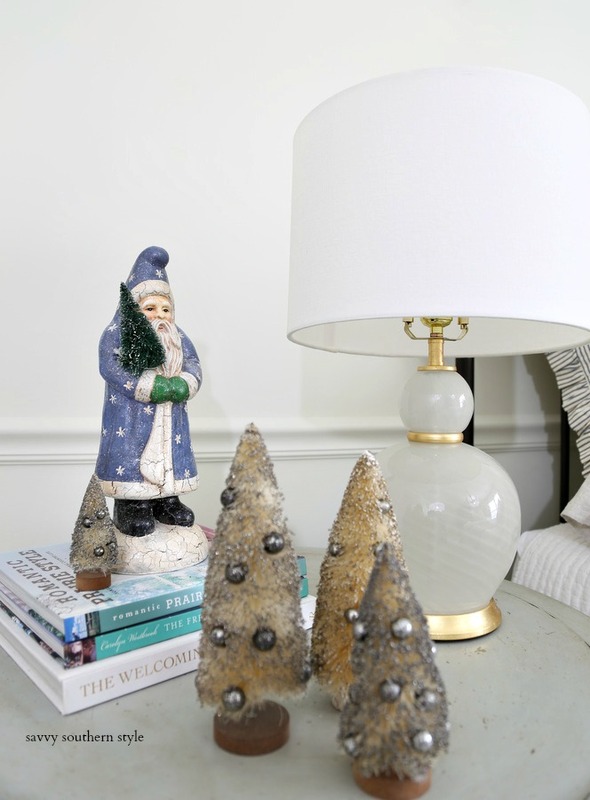 Your Christmas guests will be so happy to stay in this beautifully and thoughtfully decorated guest room!....You are a master at making a room feel so warm and inviting with many pretty details to enjoy! As always the bed linens are perfection. Happy to say Merry Christmas for the first time to you this year!...looking forward to your other "trees in a basket" soon! Have a beautiful day Kim! I love it, The pillow is adorable. 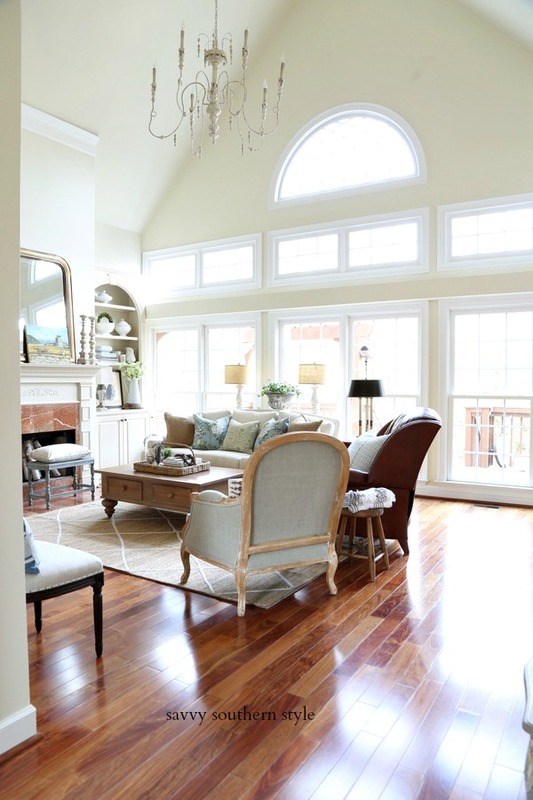 Beautiful room. I love how you've styled it. 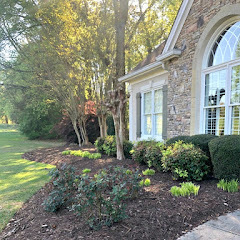 Tell mr. savvy we love the trees in baskets! It looks great Kim. I love the blue! Love the white and blue theme in the room Kim. Kim, any guest would be so thrilled to occupy this gorgeous space. 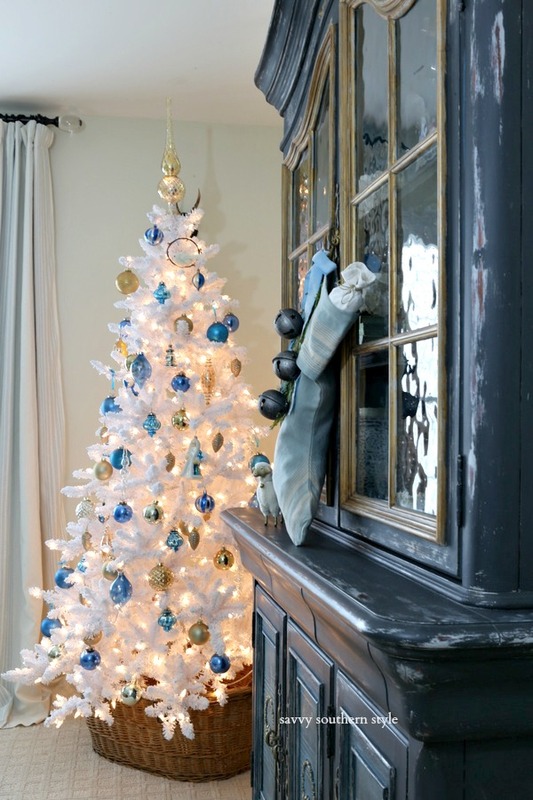 The blue and white tree is stunning! So beautiful Kim! 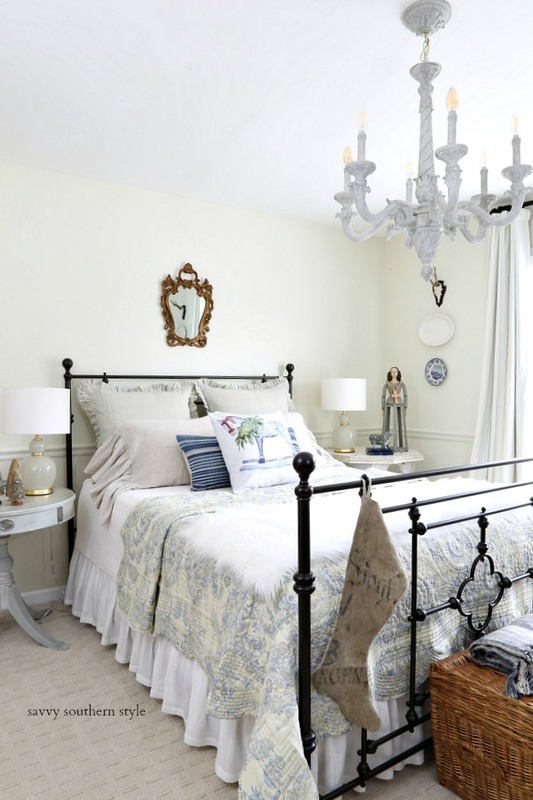 Who wouldn't want to stay in your gorgeous guest room? I certainly would! Especially dressed in its holiday finery. You have such a talent for creating beautiful spaces. Its a joy to be on this Holiday Home Tour with you! I think your room is beautiful !!!!!!!! I just loved it. I wouldn't change a thing. It's gorgeous Kim! Love the blue and gold! Always nice "hopping" with you, too! 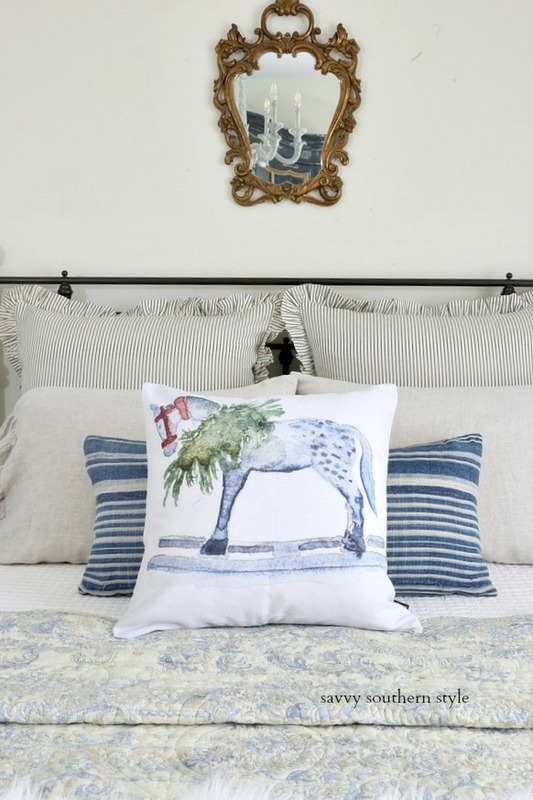 I love the blue and white striped pillow behind the horse pillow. May I ask where you got that? I bought it a few years ago. This room could be my happy place! So pretty!!!! Absolutely loving all the inspiration on this tour! How delightful a tree in the bedroom! Love the alternative colors too! A beautiful tree. What a nice treat for your guests. It's the Derby Panel Bed by Three Posts on wayfair.com. It's all just so, so lovely Kim! What a treat to be a guest in such a gorgeous room! Everything is so beautiful, Kim! 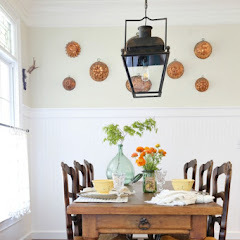 I love the basket under the tree and that gorgeous cabinet. 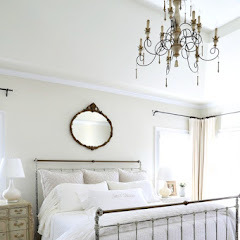 Kim, I always love how you decorate your bedrooms throughout the seasons! Love that tree!!! I love blue. 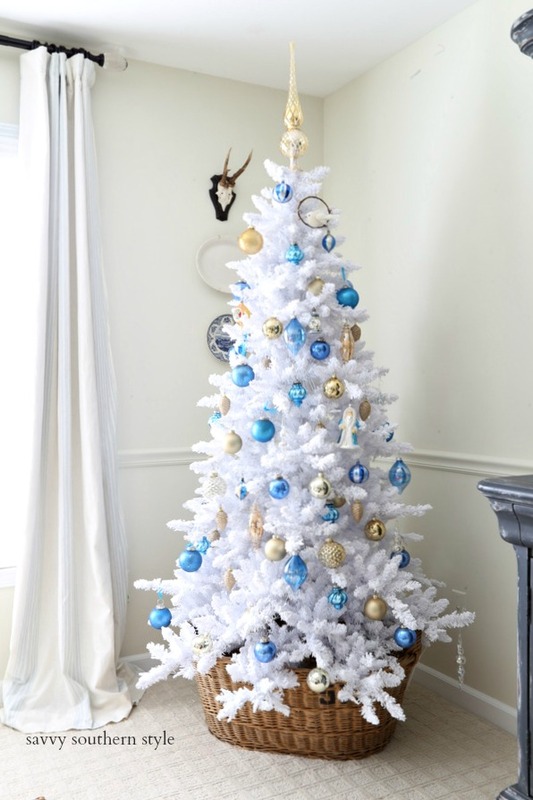 I never would've thought to put a white tree in the décor. It's gorgeous. I just purchased vintage bottle brush trees which I found at an antique store near me. I fell in love with them as the owner was putting them on display. I enjoy things like that, too. I smiled when I saw them in your home. Such beautiful touches everywhere.